One September afternoon while in Portland’s Woodstock neighborhood I drove by a former client’s home. My clients had moved, and I was curious to see how the design (installed a dozen years ago) had held up. Once clients move I rarely have continuance with the landscape. This drive by is a mixed bag. The shade tree for the back yard is absolutely perfect, and exactly what I had envisioned. This is the part of drive bys I like the best. I used a Japanese Elm – Zelkova serrata variety called ‘Wireless’ because it’s one of the few shade trees that is compatible with lawn and ‘Wireless’ is the perfect shape and size to provide shade for city landscapes. Their leaves are smaller than most shade trees and allow dapples of sunlight through the canopy to the lawn while filtering out the heat. The exaggerated vase shape of the tree also allows light to come in under the tree in the morning and late afternoon. This tree provides shade to the south facing deck and the back of the house. It will get over 30’ wide at the top. It matures at 25’ tall so it is a tree that will be wider than it is tall. If you are a discerning shade aficionado you will say hmmm…… the shade tree doesn’t have low branches so how can you sit on the back deck and have dinner without being blinded by the south sun? We kept a mature mixed hedge at the back of the property and it will block those dinner hour sun rays. The shade tree will filter the hottest sun of the day. Less successful is the privacy screen planting for the side yard. 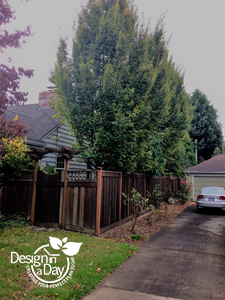 I used a narrow variety of Hornbeam (Carpinus betulus ‘Franz Fontaine’) to block the view of the neighbor’s driveway and their vehicles and also to create an attractive view from the bedroom windows. For the design to be functional, the Hornbeam would need to be pruned once or twice a year to become a 10’ narrow wall of thick leaves. The maintenance did not happen since my clients moved. Now the side yard privacy screen is wildly out of scale and the charm is gone. 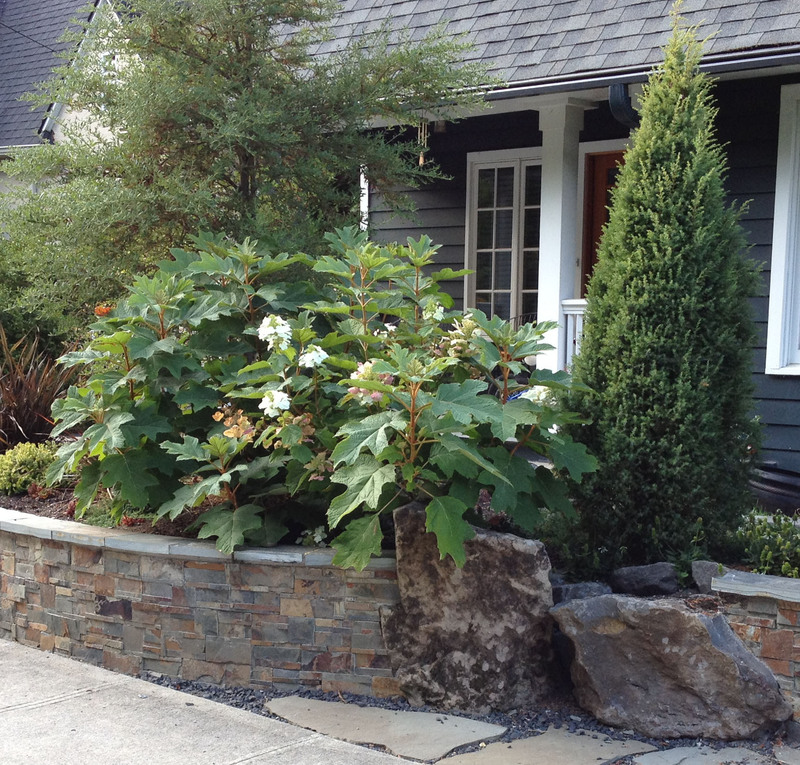 Make an appointment to start your Portland residential landscaping with designer Carol. Rachael and her family like to swim even in December when this photo was taken with the blooming Camellia Sasanqua ‘Yuletide’. Rachael and her family like to swim. They have twin toddlers who have been swimming since they were three months old. Seeing them playing like baby otters is adorable, even cuter than puppies which is saying something! Prior to the swim spa their backyard was a pleasant place with a tiny lawn, a covered patio, and some easy-care plantings. They also had a beloved gorgeous 36-inch diameter trunk California myrtle tree that shaded half the yard. The new swim spa dominated the back yard and the mud from the construction process made it a poor place for toddlers to play. This new situation was beyond heading to the plant nursery to select a few new plants. 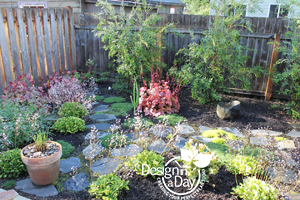 They needed a designer to re-design the backyard, create solutions for privacy and manipulate the space to maximize every inch. Rachael and I talked on the phone and we were a great fit. We scheduled a Landscape Design in a Day, my collaborative design process, and they started preparing their base drawing and working through my landscape survey questions. I was really looking forward to this one but it was going to be so tricky! We met at their home one cool spring day to create the design together. The new 10′ x 20′ swim spa sits four plus feet above the ground making the swimmers very visible to neighbors. They wanted privacy for themselves and in case their neighbors didn’t really want to watch them swim, for the neighbors too. Camellia Sasanqua ‘Yuletide’ helps screen swim spa. The privacy issues for small properties with close neighbors is often tricky. On one side of the property it was easy. 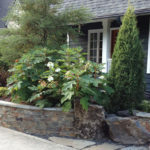 The California myrtle and a couple of mature rhododendron would solve most of the problems on that side. Three things would need to happen. We needed to stop pruning back the tops of the old rhodies, they would need to be treated each year for lace bug and be irrigated. For the last privacy hole on this side we would fill it with a New Zealand Box Tree. I will prune it myself the first few times, Azara Microphylla to help it fit into the difficult spot that is right next to the gate. It is needed to screen out a neighbor’s window that is on the first floor. It’s important to use a small tree that won’t get too big for this spot and this tree was the perfect solution. The back-property line was difficult because the swim spa was right next to the fence. We had only a few feet for a privacy planting and it needed to grow to 10 feet tall and very narrow in order to fit. I used my faithful clumping bamboo up in planters. This variety of clumping bamboo, Fargesia Robusta ‘Campbell’, stands straight up so it will not weep over and interfere with the swimming. Most varieties of clumping bamboo have too much weeping and arching shape to them and don’t work well for tiny landscapes. The planters were advantageous for many reasons. 1st we would not need to dig deep and disturb the root system of the beloved California Myrtle tree. 2nd we could use an ideal soil mixture in the planters so the bamboo would thrive. They will grow in our local clay top soil but will do much better in a soil mix that drains well. 3rd by putting them in planters they would be taller from the beginning. 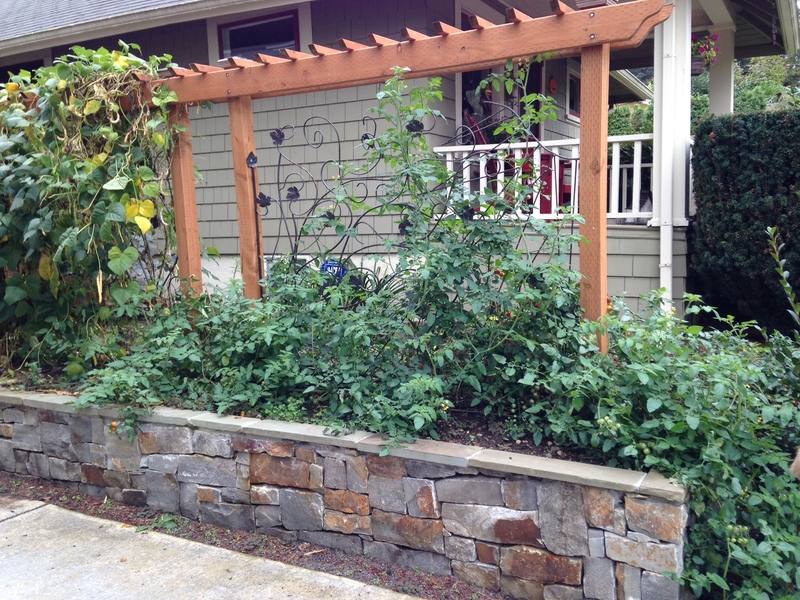 We utilized the existing walkway which fit the client’s cottage garden style and her budget. The privacy for the driveway side was the hardest. We needed to screen out a second story window at the neighbors and had no planting area to do it with. We decided to use an arbor. It fit beautifully and we were all enthusiastic about it. However, when all the numbers came in, the arbor wasn’t a practical choice. When I visited recently to see how things were growing along we talked about a more affordable solution. Before – The new swim spa dominated the back yard. Two small trees in very large pots placed strategically will be part of a future phase. In a small yard situation like this tiny backyard we can’t afford to leave the driveway to the garage read as a driveway. They didn’t use the small garage for parking a car. Using furniture and pots we made this area a sunny sitting area. 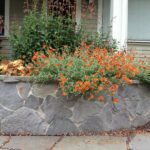 I use large built in planters to solve a variety of landscape problems and here are 5 of my favorites. The Hendrickson planter is about creating privacy for the living room window. Their Willamette Heights house is 12 feet from the public sidewalk and they live near a park so there’s lots of foot traffic. Juniper Communis ‘Gold Cone’, semi dwarf Oakleaf Hydrangea Quercifolia, ‘Sykes Dwarf’, California lilac ‘Concha’ (Ceanothus) purchased as a tree form at Kinens Big Phat Plants. 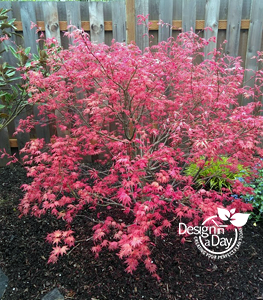 This is a specialty wholesale only grower who shapes his plants beautifully before selling which is why I love to purchase a focal point plant such as the California Lilac tree from him. Anderson planter with an arbor creates a visual barrier between the neighbors’ utility side yard and the Anderson’s driveway. The kids play in the driveway and the adults use the planter for edibles so this area has become an important part of their yard. It also adds dramatic curb appeal to the entry. The Coles….here we use green peeled logs to make a raised beds/planter. We wanted raised beds so the plants would be safe from the dogs (two very smart and active standard poodles) who fly through paths. I chose the peeled logs because they fit into the woodsy Northwest natural setting of this property. I also had the specialty cedar chips laid at 6″ deep. It’s too shady for lawn and other medium encourages fleas and doesn’t last. It’s the perfect dog friendly solution for a shady back yard. 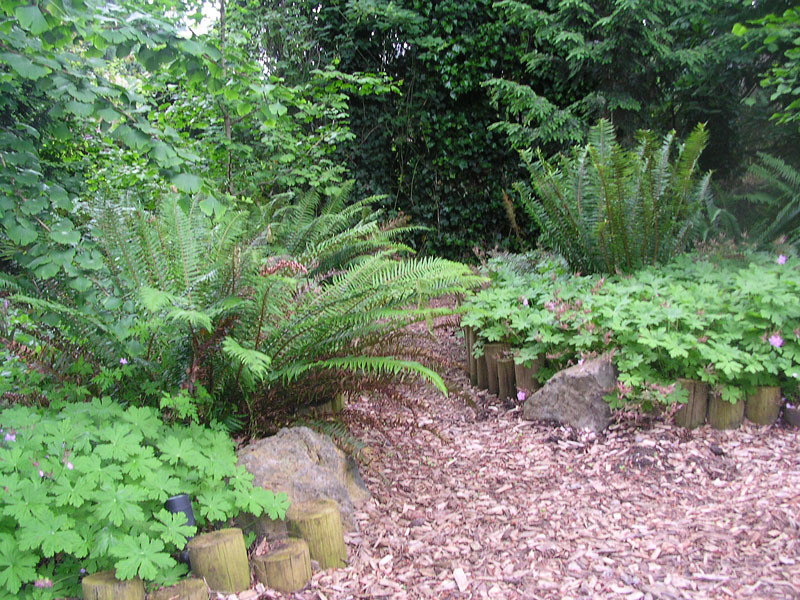 The plants pictured are native Sword Fern and Hardy Geranium, Geranium Macrorrhizum ‘Mrs. Ingwersen’ also have a woodsy look. 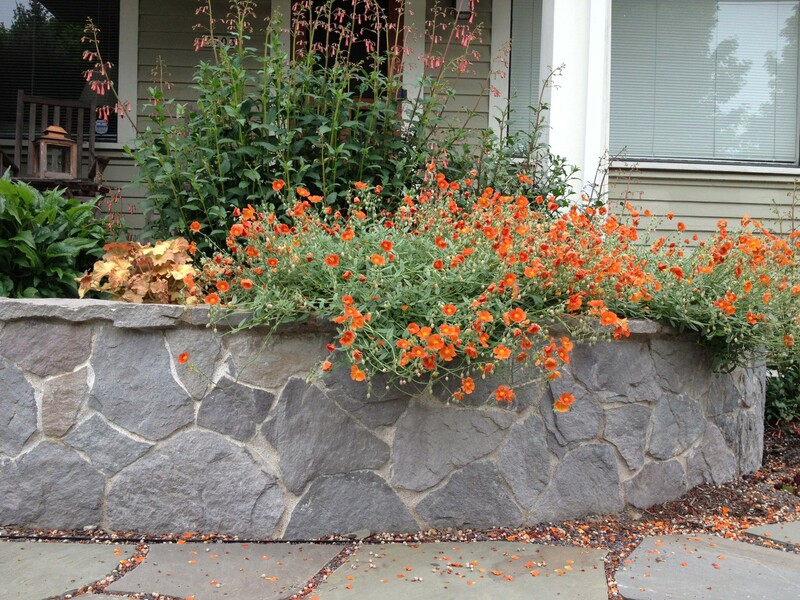 Michaelson’s planter – this stone planter gives us the opportunity to jazz up the curb appeal of this bungalow in NE Portland. It’s about creating a dramatic and colorful entry experience and visually softening the foundation below the front porch. Helianthemun ‘Henfield Brilliant’ billows over the cap of the planter. Knight – here is a very modern patio and it would be nothing without these planters. 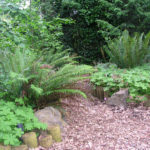 We chose planters rather than at grade planting beds because of ginormous tree roots that invaded all the planting beds. There was no room to even dig holes for new plantings. Gardening will be easier for my client who is approaching an age where bending down to tend the ground is a less attractive idea. Read more.